We have already solved the first two layers of the Rubik’s Cube. Our objective now is that the four edges of the top layer have their white color looking up, building up a white cross. We only focus in the white face edges, without paying attention to the corners. There might be four white edges in the top face of the Cube, or two, or none. If the four edges are white in the top face, we can skip to the next step. 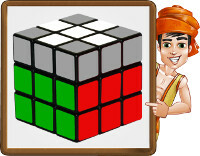 If there are two white edges in the top face of the Rubik’s Cube, apply one of the following solutions depending on whether the edges are one beside the other or on the opposite side. If there hadn’t been any white edge in the top face of the Rubik’s Cube, execute one of the two previous solutions and you will get two white edges in the top layer. Finally, execute the solution depending on the case you have obtained. What does “+ Repeat Step 4” mean? By doing this, we will solve the second cross of the Rubik’s Cube. Now it’s time to check the solution to position the second cross edges.